Chris Dyson will share the new, #20 Thetford / Norcold Dyson Racing Lola B06/10 AER 3.6 twin turbo with Guy Smith this year, for the full ALMS season, with James Weaver and Butch Leitzinger sharing the #16 car. Andy Wallace will still be closely associated with the team, and will assist with testing and development, as well as going for the wins in the two long races, with Weaver and Leitzinger. Wallace’s focus though will be on the Grand Am Rolex Series, where he and Butch Leitzinger are going for title honours in the #4 Howard-Boss Crawford Pontiac. 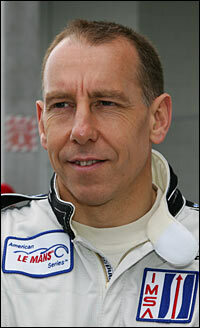 “Rob runs a one hundred percent professional operation that enjoys its racing,” commented a delighted Guy Smith. “I worked well with Chris last year, and along with Butch, Andy and James, it's a great team with great people. A driver can't ask for more." Guy Smith raced for the team at Sebring and Petit Le Mans last year, he and Chris Dyson finishing second at the penultimate race of the year. 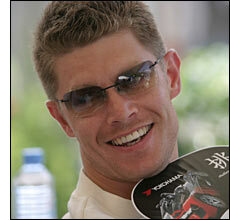 "Everyone on the team is very excited about 2006," commented Rob Dyson. “This is a big year for us and we are keen to get started on the new program. 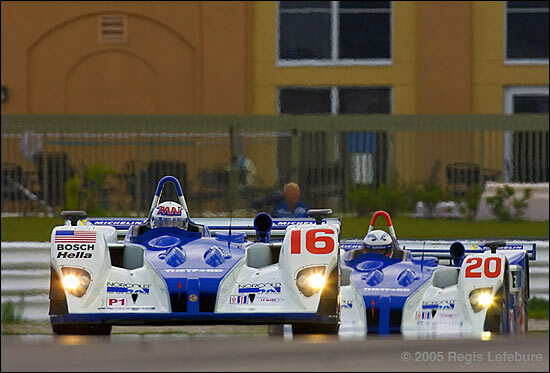 Sebring is the first step in a massive effort to bring a championship back to Dyson Racing." The new Lola AERs will be unveiled at the official American Le Mans Series Winter Test at Sebring, January 23 - 25. Rob and Chris Dyson, Butch Leitzinger and Andy Wallace will then be heading for Daytona, where they are all racing Crawfords in the Rolex 24. Here are the two Dyson cars at Sebring last March.